Which Airport Should You Fly Into For Your Galveston Cruise? We’ve said it time and again. The only real complaint about cruising from Galveston is that getting to the cruise port can be a hassle if you are flying in for your cruise. Unlike cities like Miami or Tampa, the cruise port is a considerable distance from the closest airport. Meanwhile, Houston is served by two major airports: Houston Hobby (HOU) and Houston Bush Intercontinental (IAH). That makes it even more confusing for cruisers who aren’t familiar with the area or the airports to decide which they should fly into. Unfortunately, both Houston Hobby and Intercontinental are located far from the port. Houston Hobby is considerably closer, sitting on the southeast side of Houston, compared to Intercontinental’s location due north of the city. One thing to keep in mind is that Houston is notorious for its traffic, even at odd hours. That’s why we suggest allowing up to double the “non-traffic” time if you plan to travel directly to your cruise. There is no doubt that Houston Hobby’s location makes it much more convenient for passengers headed to Galveston. Unfortunately, Hobby is considerably smaller in terms of airlines servicing the airport when compared to Intercontinental. Houston Hobby is primarily a Southwest destination. The airline dominates service from the airport. However, there are flights from Delta, JetBlue and American Airlines. Houston Intercontinental is the city’s largest airport, and also offers the most flight service. Here you’ll find nearly every airline available, with the notable exception of Southwest. If you are flying from an international destination, you will have no choice but to fly into this airport. In addition, IAH is a United hub, which serves airports around the country and the world. Both airports will offer similar service for transportation, including taxis, cruise line shuttles, car rentals, and independent shuttles to the Port of Galveston. The major difference is getting from Intercontinental to the cruise ships takes considerably more time and money than compared to Houston Hobby. For example, the official Carnival shuttle between IAH and the cruise port runs $94 per person round trip, compared to $74 from Houston Hobby. Other services, including taxis will see an even larger price jump between the two airports. Many people choose to use a rideshare service like Uber or Lyft as it is one of the cheapest options available. While we live in the area, if we had to fly in for a cruise, then we’d pick Houston Hobby 10 times out of 10. The shorter distance between Hobby and the cruise port makes HOU much more convenient to get to the cruise ship. Also, we like that Hobby is a much smaller airport in general, making it easier to get in and out. That said, not everyone can fly into Hobby or they might find a cheaper flight into Intercontinental. For us, we would have to save more than $100 per person on a round trip flight to make the extra distance and cost of getting to the port worth our while. For more details on getting from Houston airports to Galveston, click here. Getting to the Port of Galveston — Transportation options from airports and the Galveston area to the cruise port. Everything you need to know to get to the port and start your vacation. Galveston Cruise Parking — Driving to the port? Not sure where to park? We prices and profiles of all the lots near the cruise terminal. Galveston Park & Cruise Hotels — Getting in late? Leaving early? Simply need a place to rest your head? 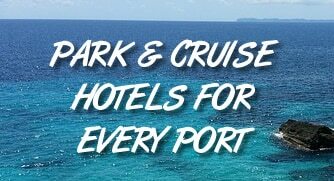 We’ve rounded up the options for places to stay near the port, including those with park and cruise packages. Looking for a hotel to stay and park for your cruise from Galveston? The hotels below all provide cruise parking packages. Click each link to read reviews on TripAdvisor, or click here to read our article on their parking packages.